Our vision at Strike Out Stroke is to enhance awareness and promote early recognition of the signs and symptoms of stroke and B.E.F.A.S.T. for treatment. ⚡️Partnering with Softball Australia, we have developed a fun 30 minute classroom activity, followed by a 45 minute active game of Softball filled with learning opportunities for students. ⚡️The program will educate Grades 3 to 6 (4 to 7 in some states) about the signs and symptoms of stroke and the need to live a healthy lifestyle. 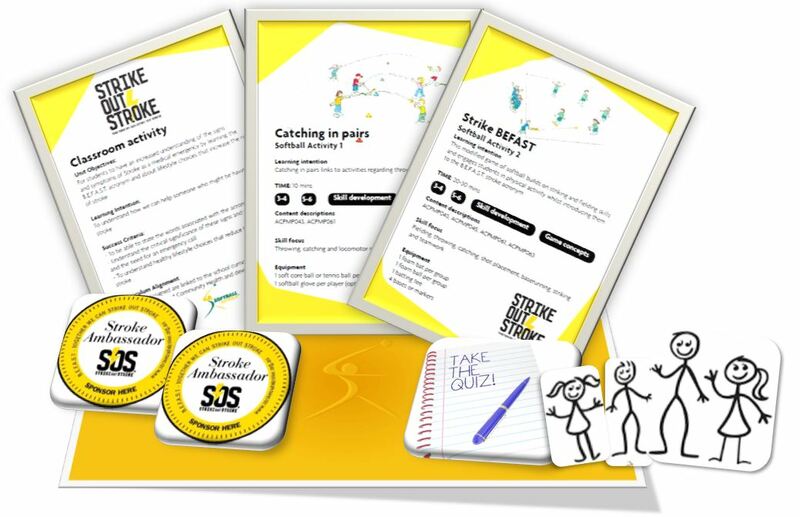 ⚡️Students will take a 10 question Stroke Quiz at school that is available on the website and upon completion will graduate to ‘Stroke Ambassadors’. ⚡️This program also aims to empower students to go home and encourage their family and friends to learn about stroke and to take the stroke quiz too. ⚡️Through student leadership groups, children will have the opportunity and are invited to create their own innovative fundraising activities. ⚡️If you think this is something that your school is going interested in participating in, see our school information pack for more in-depth details. To get involved with Strike Out Stroke is easy! Simply register your school to receive the downloadable school activity pack and you’re away. The program is FREE to run, you simply follow the classroom activities and hit the gym or the oval to conduct the softball activities.